With the Fifa World Cup 2018 final taking place this Sunday between France and Croatia at the Luzhniki Stadium in Moscow, we've rounded up eight of the best illustrations that represent the highs and lows of the tournament. 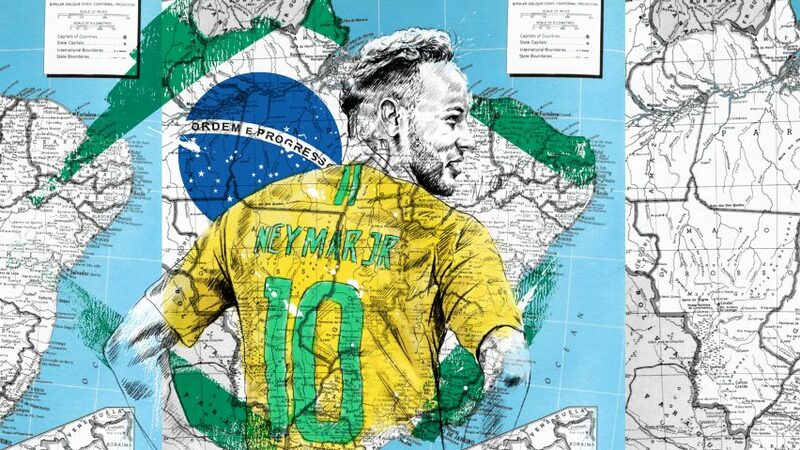 Pairing cartography with a hyperrealistic illustrative style, Michael Raisch's Football Atlas offers a geography lesson via a series of maps of the countries competing in the 2018 World Cup, with drawings of individual standout players emblazoned across them. Graphic designers Gordon Reid and Callum Stephenson called upon 20 of their peers to each submit an illustrative design related to an unusual World Cup moment – for a collection of beermats that were sold in aid of London-based charity Football Beyond Borders. Designed by artist Igor Gurovich, the official poster for this year's World Cup depicts legendary Russian goalkeeper Lev Yashin saving a football that resembles a globe, imposed on a background of 1920s-style postconstructivist graphics. Swiss not-for-profit Tschutti Heftl's sixth iteration of their alternative world cup sticker album featured illustrations by 32 different artists, who were commissioned to created portraits of 13 players in their own style for each team. London-based designer and Dezeen collaborator Jack Bedford offers a playful take on England's 52 years of hurt at the competition, with a series of illustrations depicting the reactions of fans to their singular World Cup glory followed by continued years of heartbreak. As part of an ongoing collaboration with Giphy, illustrator Sam Taylor created a set of 15 vibrant and humorous gifs ahead of the World Cup, which feature cartoon versions of objects related to the tournament, including footballs and the FIFA World Cup Trophy. As England's team made a surprise run to the semi final's, Reuben Dangoor captured the nation's football fever with a series of humorous and poignant illustrations, including a drawing of manager Gareth Southgate guiding his young lions to the plane home with their heads held high. To celebrate this year's tournament, self-taught designer and art director Tom Anders Watkins produced a set of posters dedicated to each of the 32 participating teams, with each design inspired by a well-known chant sung by the various nations' fans.